London Olympics 2012 has already begun and this year it is also being touted as the social media games. It has already broken records on Twitter when compared to the Beijing Olympics in 2008. With nations fighting for glory, brands have come forward to show their support like always. The urge to create social media campaigns has been definitely more this year compared to 4 years back. Brands like Samsung India, Acer India, P&G, etc. have shown efforts in creating awareness about Olympics and supporting the Indian athletes like YouTube India has done. One of the partners for the 2012 London Olympics has also made sure that the support for Olympics comes from its Facebook page. The brand that has more than 2.5M fans on Facebook has started a campaign to support the Indian athletes. 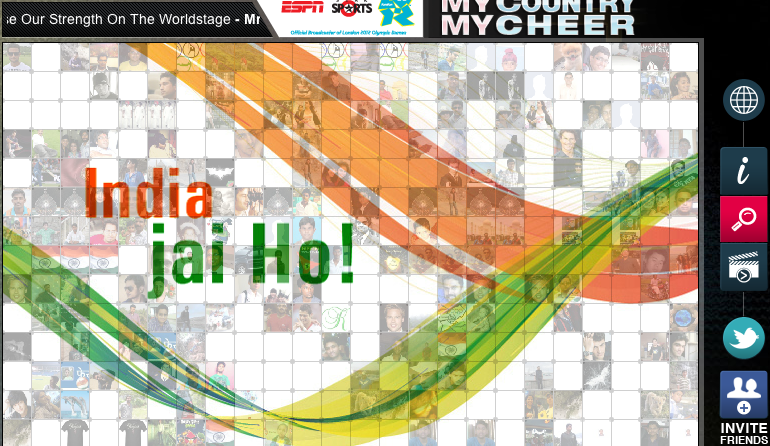 A dedicated Facebook app has been created for fans to show support for the Indian athletes competing in the 2012 Olympics. The app is a simple one where you need to speak your heart out to cheer the Indian team. The app strongly lacks any sort of creativity. Just having a simple app doesn’t do any good. At least the brand could have created a dashboard that would have been good to see the creative wishes. Even though the app uses sharing features, that doesn’t save its fate. The brand is running another similar contest on its Samsung India page which is much better. The Facebook app asks to select your favourite from the set of athletes displayed on a Facebook app. Upon selection of your favorite athlete you can wish her. In addition to this, you can see the recent cheers shared by people and also from your Facebook friends. The app is tested well and has incorporated the sharing features too. The campaign scores purely on its goal and does not rely on email procurement or giving away goodies. The brand known to support the moms of India, does the same in a much more creative way in this new campaign. Another partner at the London Olympics 2012 has created a microsite and a Facebook app too. 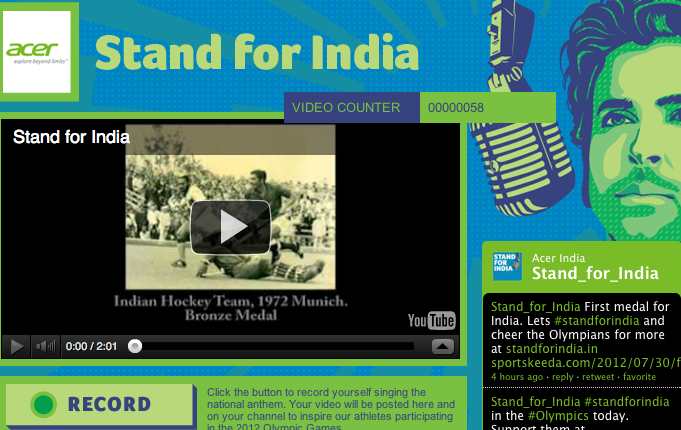 The campaign on Facebook asks you to record yourself singing the national anthem to inspire Indian athletes. The idea of singing the national anthem gives you a patriotic feeling but haven’t we seen this before. Apart from this I was not able to record the video on Facebook that I tested on the latest Chrome browser. The app also throws exception if we don’t allow the app to post on our behalf. However the content that is being shared is quite cool and the wall is submerged with updates from Olympics. The microsite is much better than the Facebook app since you can upload videos easily, share and check all the messages being shared for Indian Olympians. Twitter has also been used and the hash tag #standforindia is being used to spread the awareness to support the athletes. 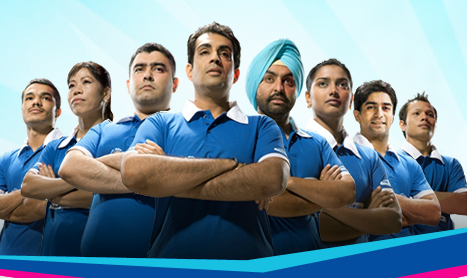 Amul India, the official sponsor of the Indian Olympic team 2012 plans to virtually energize the Indian athletes. The Facebook app provides a list of sports in which Indian athletes are representing Olympics. Once you select your sport, you can click on the ‘Energize’ button. Once you do this, either you can do the same for other sports or share or invite your Facebook friends. The app is well tested and interesting too. However, the app could have been made more interesting by adding photos/videos rather than just providing the names. Apart from this, the brand is not providing any incentive for fans to do this activity. Content has been great for its 530K fans on Facebook. Espnstar.com is running this campaign for its Facebook fans so that they can cheer for their respective country. The smart app asked me to select a pixel first to post my message. Once your message is verified then it is shown on the app. If you have a really creative message then you stand a chance to win some goodies too. The Pixel contest is not a unique concept and we have seen brands doing it in past but the option to see videos, search, share make the app quite exciting. Apart from the campaigns started by P&G and Samsung India, most of them either lack creativity or haven’t been tested properly. We definitely need to brainstorm more while creating campaigns. What do you think?